Updating your child's bedroom doesn't have to be a costly job. In fact it doesn't have to be time consuming either. With Blake's bedroom the walls are a lovely shade of blue and I like that we can jazz up his room with accessories. We have however considered updating his room with a stick and peel mural in a space or dinosaur theme as he seems to be really into those things at the moment but we've just not got around to it. Stuart and I have discussed that when we eventually buy our own home I want to stick to one colour on the walls in Blake's room so the room can grow with him. I do however want to leave one wall free so that we can get a mural for him so that he has one feature wall. 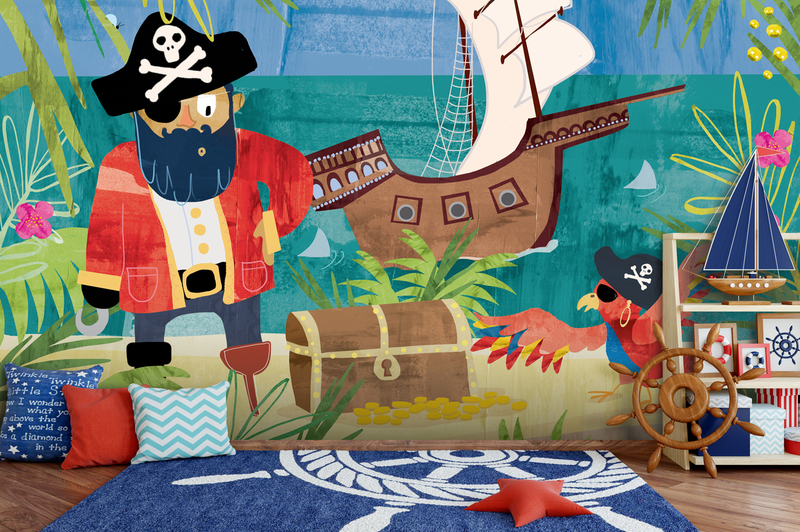 There are a great range of wallpaper and children’s wall murals available and I love the idea as as children's interests change all the time and it would mean only one wall would need to change rather than the whole room. There are some stunning designs out there too giving you the chance to find something that fits well with your child's interests. You don't even need to stop there as you can find designs for all over the home. You can select wallpaper or murals that paste onto the walls or there are plenty of peel and stick options available too which are ideal if like us you are renting. Wallsauce do so many different stunning themes some of my favourites are pirates, space, sea creatures, fairy castles and there are so many others too. Wallsauce mural's are all custom made to measure to fit your own walls ideal for akward shaped or small walls. They are easy to install with full instructions provided. Once you have found your perfect design all you have to do is add your measurements, choose your preferred wallpaper material and then order online its that simple. If you want to there is even the option to print your own image/artwork by uploading the photo onto their website and then just add in the other details like the above. I think murals are a great way to be creative in your home and children will especially love choosing a theme for their bedroom. It's also a great way to update a room if you are on a budget and don't want to fork out too much. Feature walls and murals are definitely growing in popularity in homes at the moment and I can certainly see why.